Moving averages are not fancy and glamorous. The name is not impressive and you cannot boast that you have a special, secret tool. And yet moving averages are probably the single most useful technique in the technical analysis toolkit and form the basis of many, many indicators. Your eye tries to see regularity in a chart of bars, and it does that by blanking out outlier highs and lows, considered “noise,” and seeking a center. The moving average saves your eye by smoothing out the outlier highs and lows so that you can more readily see the direction prices are moving. 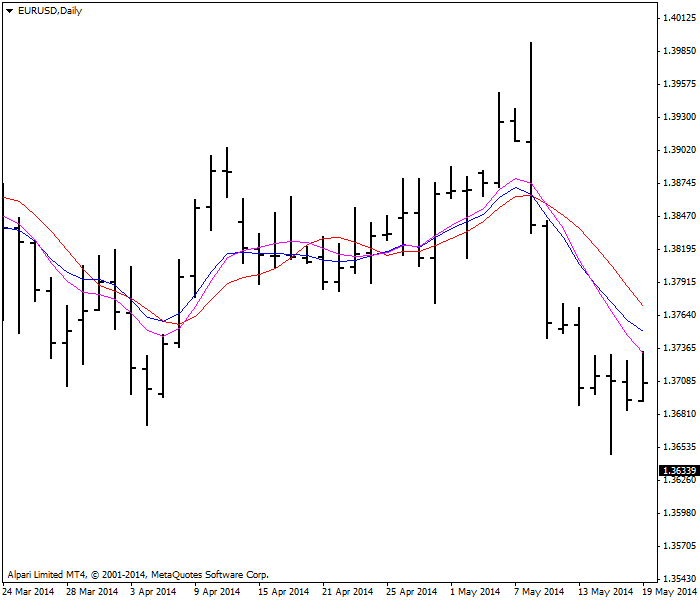 A moving average outlines the current direction of prices, but always with a lag. That would be a simple moving average. Each data point has an equal weight. You can also weight more recent data more heavily so that the moving average is closer to current prices and more representative of what is going on. There are two ways to do this — the exponential moving average and the weighted moving average. Technically, both are “weighted” moving averages. The first is weighted exponentially, and the plain “weighted” has individual progressive weights applied to each data point. All trading platforms offer these moving average variations, and so you do not really need to know how to calculate them by hand, although you can easily do it in Excel or similar software. Let’s say, you have a series of 3 data points. You apply a weight of 3 to today, 2 to yesterday, and 1 to the first day. Today’s price is three time more heavily weighted than the price three days ago. In the example in the table below, the weighted moving average for USD/JPY comes out at ¥100.63, a little higher than the simple moving average but correctly reflecting the bigger price move between Day 2 and today. Trick: You have to remember to sum the weighting factors correctly. It is easy to forget that when you multiply by one, nothing happens to the base amount, but when you add it to a series, the series goes up by one. This may seem too obvious to mention, but when you divide the weighted sums by 5 instead of by six, you can be scratching you head to find your error. where N — the number of periods. These percentage amounts are applied to the last data point added to the series, so that the last data point in a 50-day exponential moving average is weighted by 3.92%, but in a 10-day, by 18.8%, obviously a far higher amount. The exponential moving average weights the most recent data more heavily and is by far the most widely used moving average technique in Forex charting. 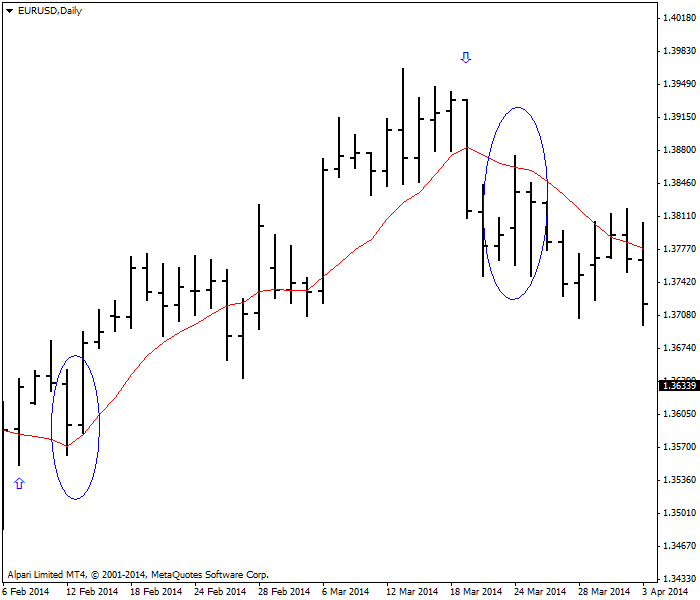 A comparison of three types of moving averages is presented on the figure below. The topmost red moving average is simple. The next blue one is exponential. The bottom one is purple weighted. The most used numbers are 10 periods, 20 periods, 50 periods, and 100 periods. For daily chart work, the 200-day is usually added since it’s the magic “long-term” number and can be a powerful force when it is neared by current prices. Some analysts use the 100 and 200-period on all charts, even the hourly, although there is no evidence this adds any particular value. For example, no less an important name than Citigroup’s technical analysis team will sometimes name the 200-period moving average from the 4-hour charts. As in all matters pertaining to technical analysis, a metric is important and takes on market-moving capability if a sufficient number of traders buy into it. Buy at open 02/10/14 — 1.3627. Sell at close 03/20/14 — 1.3774. Difference: 147 points. But right away, you can see the problem with this trading rule — sometimes the price will violate the moving average for only a day or two, as shown in the circles. In this case we ignored the one-day violation, but if you had obeyed the trading rule to the letter, you would have been whipsawed — exiting after only a day or two only to restore the original position. Whipsaws are very, very common in the price/moving average crossover trading rule. A possible solution is to require the price reverse by more than a single day, or by two or three. You can also add a safety cushion to the moving average, which ideally would be based upon the historical record of the optimum number of points to add or subtract in order to avoid being whipsawed. Note that the optimum number of points for a false downside crossover is probably different from the optimum number of points for a false upside crossover due to trending bias, and the optimum number of points will change over time as the currency becomes more or less volatile. Pro tip: If you are going to put moving averages on your charts, always use the same color for the 10-period, the 20-period and so on. In no time at all, you will be subconsciously noting where the price is relative to these important moving averages. outdated and hardly ever used. one of the most popular technical indicators. 4. Moving averages cannot be used to get a buy/sell trading signal.